This basic Investment Property calculator will show how much you need to invest weekly and annually as well as how much capital gain you might get if you sell your investment property after certain years. This free investment property calculator is built based on ATO rental property spreadsheet. It automatically calculates the income tax before and after deductions. It in addition shows the gross rental yield of your investment property. 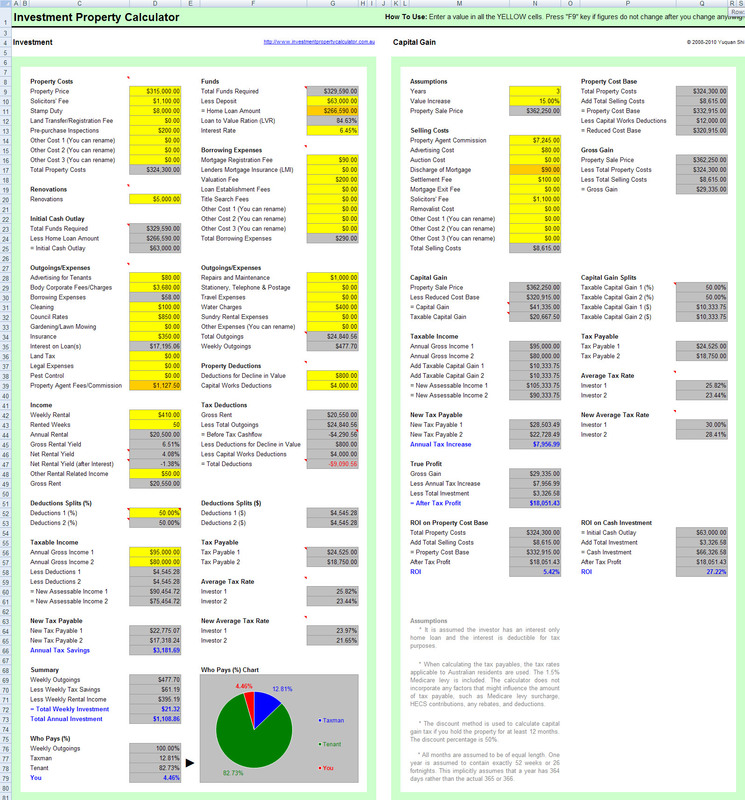 Here is a screen shot that will give you a better idea that what you need to do and what this free property calculator can tell you. To help you understand how to use this property calculator better, please see this example from my personal experience on rental property investment. You should read these useful tips to buy the right investment property. Please note that this free property investment calculator DOES NOT automatically populates all the government tax, duties, and the construction cost depreciation. If you would like to save your time from calculating all the government tax, duties, etc, you can purchase the Standard Investment Property Calculator or the Professional Investment Property Calculator for a value-for-money price for your personal use. This calculator is built in Microsoft Excel worksheet. You need to have Microsoft Excel 2007-2013 and Microsoft Windows to use it. You might want to check out the Free Mortgage Home Loan Repayments Calculator and the Free Mortgage Home Loan Amortization Calculator. They should be useful for your property investment. Sole investor or just one investor? You can use this FREE Investment Property Calculator by changing the "Deductions Investor 1 (%)" to 100% and the "Annual Gross Income Investor 2" to $0. Alternatively, you can download the even simpler FREE Investment Property Calculator for One Investor! If you consider buying an NRAS investment property, you may want to try the Free NRAS Investment Property Calculator before you buy the paid NRAS Investment Property Calculator. If you consider buying an investment property through self-managed super fund (SMSF), you may want to try the Free SMSF Investment Property Calculator.